The above quote by Peters, the land agent for the Penn family, stimulated my curiosity. Conrad Weiser was a very influential man in early Pennsylvania history. Called a buckskin diplomat, Weiser was the Indian interpreter and treaty negotiator for the Lenape Indians and the Penn family from 1732 until his death in 1760. He was known to the governors of several states and to many Indian chieftains as far away as Ohio, Virginia, and New York. A builder of churches and schools, Weiser was the founder of Reading and Berks County and has been named Man of the Year in 2002, the 250th anniversary of the birth of Berks County. What happened 250 years ago to warrant this comment by Peters? As one travels the perimeters of the present day, diamond-shaped Berks County, it becomes apparent that the county is vast. It takes a good hour to get from one point of the diamond to any other point. And this is accomplished by operating a gasoline-powered automobile over modern cement and asphalt highways. What would it have been in the early days of the county – 1752 – when the roads were few, made of dirt, and the conveyance a horse or wagon? The boundaries appear arbitrary. Except along the northeastern border that follows the ridge of the Blue Mountains, the boundary lines do not follow a creek or natural divide. At its edges, there is an overlapping mixture of house styles and construction materials. Who were the prime movers and shakers when the county was new? The first European settlers in Pennsylvania in 1638 were the Swedes, who lived along the Delaware and Schuylkill Rivers and traded with the Indians. William Penn, who came on the scene in 1681, was interested in giving the Swedes’ already cultivated lands along the Schuylkill to his Quaker friends, so he offered them free land far to the northwest as an enticement to move. Perhaps with Penn’s quote as advertisement and/or inspiration, Andrew Rudman accepted 10,500 acres from Penn and led a group of his countrymen north of the Manatawny Creek into the lower reaches of the Oley Valley in 1701. They maintained amiable relations with the local Indians. As a result, the first township was called Amity. Along with Rudman were the families of Bankson, Boon, Yocum, Robeson, Mouns Jones and others. They built log houses in the Swedish tradition, then stone houses and a Lutheran Church in Morlatten (Molatten) near present day Douglassville. The oldest house still standing in Berks was built by Mouns Jones in 1716. Historical Note: Back in Philadelphia, along the Schuylkill, the botanist Jonathan Bartram took up residence in the former stone house of Mouns Jones and transformed that into a lovely estate filled with plant life from his travels all over the Province and other colonies. The Swedes were followed into the Oley Valley and beyond by a flood of humanity – Germans, (family names of Schneider, Lesher, Hiester, Weidner), French Hugenots (Bertolet, Levan, Deturk, and Lorah) and English – both Quakers (Lincoln, Boone, Lee, Lightfoot, Starr, Parvin,) and Episcopalian (Douglass). Families from Wales were in the southern portions. They had acquired 40,000 acres from William Penn in Chester County, the South Mountains, and along the Wyomissing and Cacoosing Creeks where they operated grist mills and attended their meeting houses. The family names were Evans, Griffith, Morgan, Price and Jones. Four townships were organized and named by them – Cumru, Ruscombmanor, Brecknock, and Caernarvon. Another group of Lutheran and Reformed Germans came down from New York after 1723 and built houses and Rieth’s Church west of the Schuylkill in the townships of Heidelberg and Tulpehocken. The family names were Fidler, Werner, Ham, Rieth (Reed), Schaeffer, Sheetz, and others. Conrad Weiser was in this latter group, arriving in 1729. He built a stone house for his wife and children in Heidelberg Township, an area still officially Indian land until 1732. Lenape clans remained for several years, even after their final treaty in 1732. Their place names in the county include village sites and creeks: Allegheny, Cacoosing, Manatawny, Maxatawny, Monocacy, Moselem, Oley, Ontelawnee, Sacony, Tulpehocken, Wyomissing. The northern Lancaster and Philadelphia region was a diverse mix of religion and nationality, but before long, with war and trouble in the fatherland and tales of inexpensive, fertile farmland, most of the population was comprised of Germans. Farmsteads were scattered across the valleys and settlements grew slowly around churches, mills and forges along the creeks. There was no central town of any size. The governing body was the General Assembly, comprised of elected members. In the early years, the men were Quakers, both Welsh and English. The Assembly listened to petitions, heard suggestions for changing or adding laws, and made legal changes. Until 1740, all legal matters were heard in the Court of Quarter Sessions, and voting and taxes were taken care of in Philadelphia, the seat of government for Pennsylvania. Farmers brought their farm and household goods to the commodious Philadelphia Farmers Market for the highest prices. After 1740, when Lancaster County was erected and encompassed lands west of the Schuylkill River, those residents in the townships of Cumru, Bethel, Brecknock, Heidelberg and Tulpehocken traveled south to the county seat in Lancaster for court matters and farmers markets. Lancaster appointed Conrad Weiser a Justice of the peace in 1741 and thereafter civil disputes and minor complaints were brought to him. There were arguments over land boundaries that became violent when a boundary tree here and there was set afire. The mill owners along the creeks complained about the neighboring upstream millers who would dam the creek for such a long period of time that there was not enough water for their downstream mill. Weiser also mediated arguments between the white settlers and the Lenape over land use or trade. He was well versed in their language and customs; his homestead was often the site of Indian encampments. As more and more immigrants arrived, the legal transactions, civil complaints and lawsuits increased. Land transfers, probating of wills and estates, as well as arrest warrants and trials of criminals all required a trip to Lancaster or Philadelphia. These transactions took travel time over bumpy dirt roads and overnight stays in the many taverns and inns in town. Because of the great distances to court, and with the population ever increasing, in 1739 one hundred and seventy-two men from northern Lancaster County presented a petition to the Assembly asking that a new county be created. The Assembly took no action. Lacking a town, there would be no new county. In 1745, another petition was drafted and signed by John Potts, Henry Harry, William Bird, Francis Parvin and others. This too was read to the Assembly. Later efforts that year were unsuccessful. In 1750 and again in 1751, the residents tried again. By this time, York and Cumberland Counties had been erected, both comprised mostly of German immigrants, and this was encouraging news. One cannot view the foundation of Berks without including that of Reading, as they have been dependent upon each other from the beginning. Reading was a contrived town. There was no mill at its center, no crossroads that encouraged growth. Aside from the Widow Finney’s log cabin by a spring, there were only the remains of Indian villages nearby and a well-worn path where from time immemorial native tribes had crossed the shallow ford at the Schuylkill. After William Penn’s death his sons, Thomas and Richard, became the Proprietors of the Province. When the decision was finalized to build a town, several sites were examined by surveyors before the Penn brothers decided upon the ideal spot for a county seat. It was then that they discovered they had already sold the land to speculators, not one of whom was willing to give it back! By that time, of course, everyone knew there were plans for a new county and the land was much more valuable. It took some finagling on the part of the Penns to re-acquire the land, but get it back they did. The town of Reading was surveyed, the streets laid out. Three Lot Commissioners were chosen: Quakers Francis Parvin and William Hartley, and Conrad Weiser. Hartley soon died and Weiser was the only one who could speak German. Lots were divided and sold, the outlying land was rented for livestock, grain and orchards. And yet no one built a building! Settler confidence was low. There was still no county to support such a town. Commissioner Weiser understood the importance of having an active town that would later serve as the county seat of government. He was the first to pick up a shovel and build in the fledgling town. Others followed suit. His log store, at today’s 5th and Penn, was a trading post sometimes called Weiser’s Wigwam. Three of the first seven buildings were owned by him. When 1752 rolled around, the men of northern Lancaster, Chester and Philadelphia counties were better prepared. Their petition was presented and read to the Assembly, Feb 4, 1752. It was a good thing there were no inspectors in Reading to count houses. Deeds were issued only after a house had been built or an improvement made. Deed research reveals that only seven houses were built in 1751. The year 1752 proved to be a real estate boom for the new town. By looking at a timeline of the construction, one can sense the urgency to build that must have driven Weiser. He knew how important a good sized town would be to the Assembly when they made their decision. In addition to overseeing the sale of lots and construction in Reading, Weiser’s account book, translated in 1981, reveals that he paid for the writing and copies of the petition, filing fees, and surveys for the proposed county. In January, he traveled “to and fro Philadelphia” for the new county. There was another 33 days noted to see the county charter through to completion. In his lobbying efforts, he even paid five shillings to the door-keeper of the Assembly. A man of vision, it is fitting that Conrad Weiser be given special mention on the 250th anniversary of Berks County. After 14 years of petitions, the charter was granted. The town and county – Reading and Berks County – were named after the English home of the Penn family – Reading in Berkshire, England. The twenty existing townships included Albany, Alsace, Amity, Bern, Bethel, Brecknock, Caernarvon, Colebrookdale, Cumru, Douglass, Exeter, Heidelberg, Longswamp, Maiden-Creek, Maxatawny, Oley, Richmond, Robeson, Ruscombmanor, and Tulpehocken. As portions were carved from three counties, surveyors were appointed to mark the bounds: Nicholas Scull from Philadelphia County, Benjamin Lightfoot of Chester County, and Thomas Cookson from Lancaster County. They extended the borders as far as the Susquehanna River, taking in more than two and a half million acres. Berks County was to remain this size for twenty-two years. Almost at once there were disputes along the southwestern border that split in half the townships of Caernarvon, Brecknock, Cumru, Heidelberg, Bethel and Tulpehocken, leaving one half of each still in Lancaster. A new survey was completed in 1759 by Nicholas Scull, and others followed in subsequent years to iron out problems. After one survey in the early 1800s, Trinity Tulpehocken Church “left” Berks for Lebanon County as the lines were redrawn. With the advent of more precise instruments and computer cartography, new surveys completed in the 1990s corrected earlier errors. The new line drawn dissects a former canal-side store and at least one farmhouse, aptly called County Line Farm, in Marion Township. The land, barn and most of the house are in Berks. Only the master bedroom is on the southern side, which was the decisive factor in county determination. 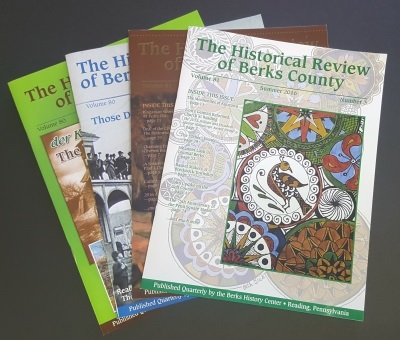 This article originally appeared in the Winter 2001-2002 issue of the Historical Review of Berks County.